Atlanta will host the 2019 Super Bowl at its Mercedes-Benz Stadium. 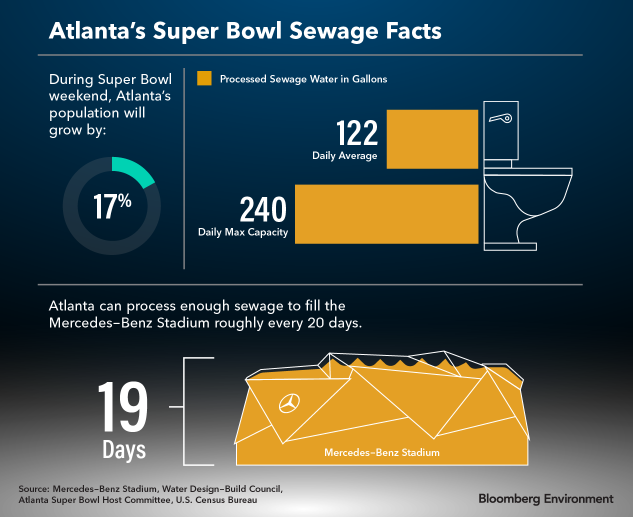 Hosting the Super Bowl is a high-stakes showcase not just for Atlanta and the competing teams, but for the city’s wastewater treatment facilities. With so many people flocking to the area, treatment plant operators have to be ready to ensure they can handle all the extra flushes. That means not just more wastewater but sometimes different wastewater. For example, scientists have found that, during the Super Bowl, sewage can contain significantly more of a chemical called benzoylecgonine, a byproduct of cocaine use. If Kishia Powell is worried about this, she’s not showing it. The commissioner of Atlanta’s Department of Watershed Management said her city has enough wastewater treatment capacity to ensure visitors are thinking about football while they’re in town, not sewage. The region’s largest wastewater treatment plant can process a daily average of more than 240 million gallons of sewage, about double the city’s regular daily average volume and enough to fill Mercedes-Benz Stadium to the brim roughly every 20 days. But what is everybody flushing? Daniel Gerrity, an environmental engineering professor at the University of Nevada, Las Vegas, conducted a study in 2010 to find out. He sampled the wastewater flowing into the treatment plant of a major U.S. metropolitan area (he wouldn’t say which one) at two different times: during Super Bowl weekend and another weekend one month later. He and his colleagues found there was 45 percent more benzoylecgonine, the cocaine metabolite, in wastewater during the Super Bowl weekend than after. But Gerrity said concentrations of this and other illicit substances in wastewater during the Super Bowl, while higher, are still low enough that they have little to no impact on the environment. The volume is what makes Powell’s job challenging. And it could be even more difficult if it rains on game day and treatment plants have to process both sewage and stormwater. Wastewater problems have plagued another recent sporting event: the 2016 Summer Olympics in Rio de Janeiro. The Brazilian city failed to meet its goal to cut by 80 percent the amount of untreated sewage flowing into Guanabara Bay, where events such as sailing and windsurfing were held. Atlanta has had its own difficulties with sewage: Like many other cities across the country, it has been under a court order for the past two decades requiring it to upgrade the city’s sewer system. Powell said Atlanta has invested $2 billion to bring its system into compliance with federal pollution regulations so the city doesn’t dump untreated sewage into lakes and rivers during big storms. The location of this year’s Super Bowl may help with that goal: Brady’s New England Patriots and Goff’s Los Angeles Rams will play at Mercedes-Benz Stadium, a more than $1.5 billion sporting facility that opened downtown in 2017. The stadium uses all waterless urinals, low-flow toilets, and is designed to capture all the rainwater that falls on it in underground vaults, according to Tim Trefzer, sustainability director with the Georgia World Congress Center Authority, which owns the stadium. These features were built into the stadium because much of downtown Atlanta is paved over, which makes the neighborhood west of the football field prone to flooding during large storms, Trefzer said. The main river that receives stormwater (and any other liquids) from the Atlanta metro region is the Chattahoochee. Jason Ulseth, head of the environmental group Chattahoochee Riverkeeper, said he’s confident that the city can handle the upcoming spike in toilet flushes without damaging the local ecosystem. But he said there’s more than just human waste that can harm the environment.